The DMX firing box also adds extra functionality. Yes, you can get automation by connecting it to your DMX lighting panel or control console. But you also get an indicator, right there on the firing box front panel, telling you that the connections you’ve made with the link cables are good. In fact, that’s what the end-of-line indicator is for. As well as that electrical confirmation, there’s a mechanical verification too. 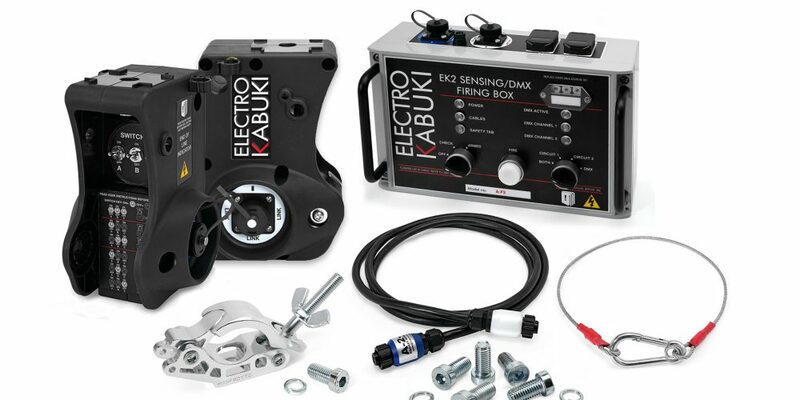 Any EK module that has its safety tab in place – perfect for test drops without actually dropping – flashes a bright blue LED on the firing box. That’s an instruction to go and check the modules; each has a blue LED on its underside. Steady-state means all is well: the safety tab is off. The one that’s flashing is the one with its safety tab still in place. Not what you want when you’re about to unleash the big reveal! What do you get in the new Starter Pack? Obviously, a DMX/Sensing Firing Box. Four EK modules, two wired as Circuit 1, the other two as Circuit 2. An end-of-line indicator, which is required for feedback of electrical continuity by the DMX protocol. A power cable. A half-metre cable to link the indicator to the final EK module. Three two-metre link cables to interconnect modules. And a 20-metre link cable to run from the Firing Box to the nearest EK module. Plus, five Manfrotto clamps to make rigging really easy. Like the Basic Starter Pack, our special pricing for the DMX Starter Pack represents a significant saving over buying the parts individually. It is priced in the UK at just £2,135.00. So you essentially get the four EK modules for free! 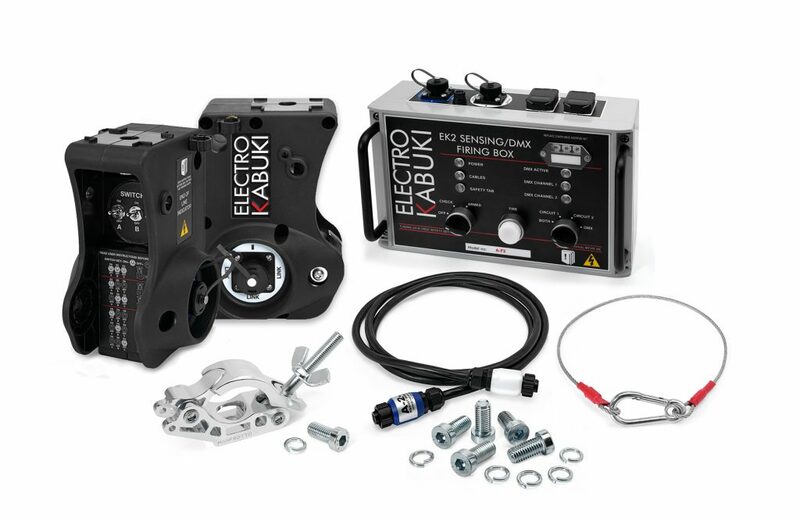 It’s the same deal with our Basic Starter Pack: for £1,250 you get the Basic Firing Box, cables and clamps, again meaning no charge for the four EK modules. Due to this special pricing, our Starter Pack offer is strictly limited to one per company. Bear in mind that these prices are subject to VAT in the UK and taxes where applicable in other regions. We calculate the exchange rate for export shipments at the time of order.